Around 350 immigration detainees are into their fifth day of hunger strike protest at Yongah Hill detention centre. A list of demands was released by the Yongah Hill protesters on Monday, 14 January (see below). The detainees will hold a protest in the yard of Hawke and Falcon compounds at 11.30am Perth time. The protesters have asked the media to come to Yongah Hill to see the protest and talk to the detainees themselves. “We want to show the media that Border Force is lying when they say there is no protest at Yongah Hill. 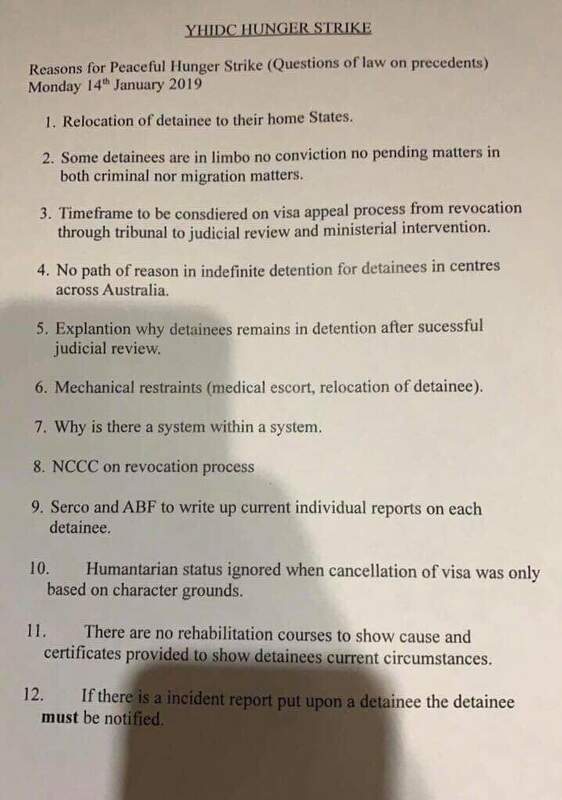 We have been asking Border Force why we have been detained so long; what is happening to our cases, but they have no answers,” one detainee told the Refugee Action Coalition. A room search conducted this morning at 7.00am Perth time was just another way to try and intimidate the protesters. The hunger strike protests last week at the MITA North and now at Yongah Hill have exposed the conditions inside the onshore detention system, and the routine abuses – arbitrary arrest and punishment, use of handcuffs, lockdowns, assault – that detainees are exposed to. “The government has tried to maintain a wall of silence around the onshore regime. There is no independent oversight of onshore immigration detention. Border Force and Serco guards act with impunity,” said Ian Rintoul , spokesperson for the Refugee Action Coalition. “There are fundamental injustices associated with the use of immigration detention and Ministerial power that have to be addressed. Ministerial power to over-ride court decisions are a denial of natural justice and would not be acceptable in the criminal justice system. Border Force and the Minister are laws unto themselves.